VMware is advancing its hybrid cloud strategy, rolling out tools to help companies operate private managed clouds and strengthening its ties to Amazon Web Services, the company said on Wednesday. 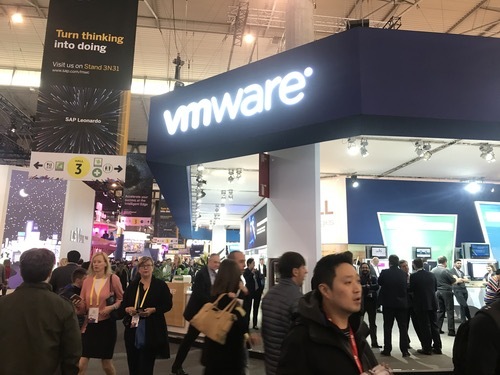 VMware at Mobile World Congress last week. Hybrid Cloud Extension Services allows enterprises to move applications "without modification, with little or no application downtime, and across heterogeneous VMware vSphere environments," the company said in a statement. VMware added support for VMware Cloud on AWS to its Wavefront by VMware Service for monitoring and analytics to optimize cloud-native and enterprise applications. The service also supports Pivotal Cloud Foundry and enterprise applications running on VMware-based private clouds. VMware introduced log intelligence services, for IT troubleshooting and log management across multiple clouds, including VMware Cloud on AWS. And the company expanded its Cost Insight Service to assess the impact of migrating to VMware Cloud on AWS, adding to existing support for Microsoft Azure and VMware private cloud data centers. Additionally, VMware extended VMware Cloud on AWS to Europe in the AWS London Region. And the company expanded its partner program to support VMware Cloud on AWS. The hybrid cloud strategy has been successful for VMware, which reported financial results for the fourth quarter and full fiscal year March 1. Revenue for the fourth quarter was $2.31 billion, up 14% year-over-year, and the full year was $7.92 billion, up 12% annually. On a conference call with analysts, CEO Pat Gelsinger cited cloud in general, and the AWS partnership in particular, as growth drivers, as well as mobile, security and networking.